An altar will be set up at the beach.The altar will be decorated with ivory coloured chiffon and artificial flowers. Special wedding table will be prepared under the Altar and it will be decorated with ivory coloured chiffon and artificial flowers. Ring pillow in decoration colour will be prepared. 2 artificial flower arrangements on long metal stands will be placed on both sides of the Altar. White lacquered chairs will be decorated with ivory coloured chiffon bow ties. 4 artificial flower decorations on high metal stands, decorated with ivory coloured chiffon bow ties, will be set up at the bridal walking way. 6 bamboo lanterns, decorated with ivory coloured chiffon bow ties, will be placed between the flower arrangements. A white carpet is rolled out and sprinkled with red rose petals. A bottle of champagne for bride & groom. A champagne glass will be served for each guest. The chairs and tables will be decorated with ivory coloured chiffon and on the tables will be pink or turquoise coloured runners. The tables will be decorated with fresh and artificial flowers and other accessory, mirror under plates will be set up, napkins will be tied with napkins bracelets of satin ribbon. Candles and candle holders also will be set up. 4 artificial flower decorations on high metal stands, decorated with ivory coloured chiffon bow ties, will be placed at the bridal walking way. 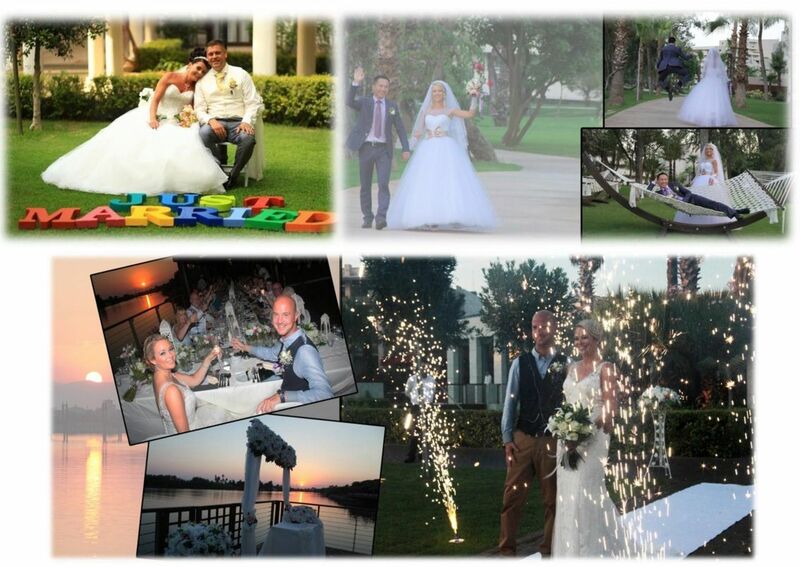 Wedding City Antalya Team will come to the Hotel at 13.00; will serve up to 24.00 o’clock.